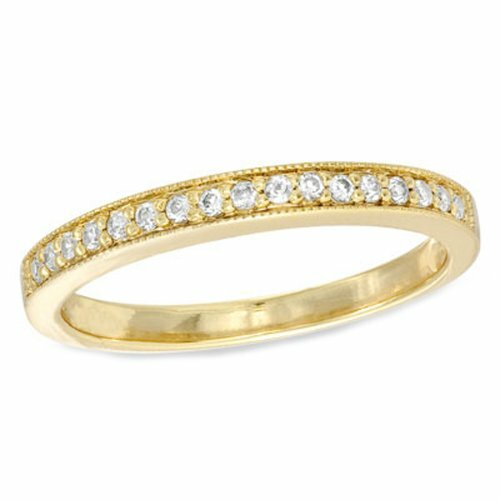 Slip this enchanting 10k Yellow gold diamond band onto that someone "specials" finger, creating a moment the two of you will always treasure. From that special day forward, this ring will serve as a memory of that day. Set with 17 shimmering round diamonds totaling .17ct tw. and detailed with a antique milgrain finish. It's a thoughtful, polished look she'll adore. Available in Rose and Rose Gold for a "stackable" look. If you have any questions about this product by ZE, contact us by completing and submitting the form below. If you are looking for a specif part number, please include it with your message.